Enveloped, spherical, about 50 nm in diameter. The surface proteins are arranged in an icosahedral-like symmetry. Monopartite, linear, ssRNA(+) genome of about 9.7-12 kb. The genome 3' terminus is not polyadenylated but forms a loop structure. The 5' end has a methylated nucleotide cap (to allow translation) or a genome-linked protein (VPg). 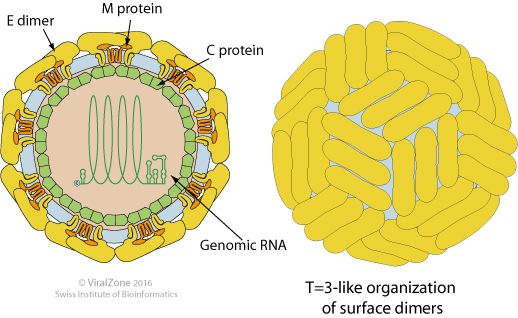 The virion RNA is infectious and serves as both the genome and the viral messenger RNA. The whole genome is translated into a polyprotein, which is processed co- and post-translationally by host and viral proteases. The positive-sense genomic ssRNA is translated into a polyprotein, which is cleaved into all structural and non structural proteins (to yield the replication proteins). Replication takes place at the surface of endoplasmic reticulum in cytoplasmic viral factories. A dsRNA genome is synthesized from the genomic ssRNA(+). Virus assembly occurs at the endoplasmic reticulum and seems to be facilitated by the viral ionic channel. The virion buds at the endoplasmic reticulum and is transported to the Golgi apparatus. HCV: Heparan sulfate, LDL-R, CD81, CLDN1. Pestiviruses: hemorrhagic syndromes, abortion, fatal mucosal disease. VACCINE Japanese encephalitis virus, Tick-borne encephalitis virus, West Nile virus, Yellow fever virus, Bovine diarrhea virus, Classical swine fever virus. Dengue NS1 protein inhibits host complement by binding C4 and reducing C4b deposition and C3 convertase activity. Through this mechanism, NS1 protects DENV from complement-dependent neutralization in solution. .
Flaviviruses NS3 induces apoptosis through host caspases activation . 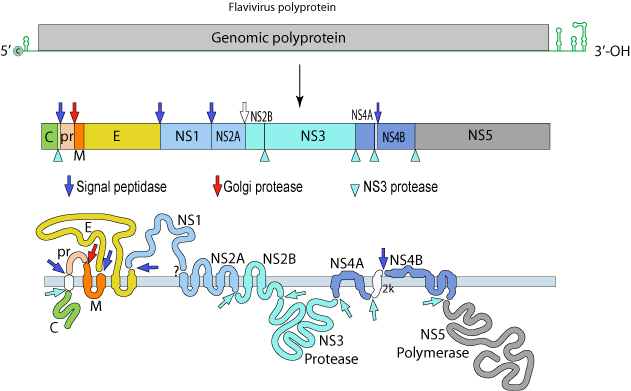 Flaviviruses NS4A and NS4B induces autophagy signaling . Hepatitis C virus induces down-regulation of the retinoblastoma tumor suppressor and G1/S host cell cycle checkpoint dysregulation . Hepatitis C virus inhibits the host IFN-mediated response by blocking host MAVS , TRAFs and TBK1-IKBKE-DDX3 complex , whilst pestiviruses N(pro) blocks host IRF-3 . Hepatitis C virus activates PKR about 12h p.i. to shutoff host translation through the PKR-mediated phosphorylation of the eIF2alpha initiation factor .